Norwegian company FXI Technologies has been showing a USB stick-sized portable computer prototype, featuring with a dual-core 1.2-GHz CPU, 802.11n Wi-Fi, Bluetooth, HDMI-out and a microSD card slot for memory. Codenamed Cotton Candy because its 21 gram weight is the same as a bag of the confection, the tiny PC enables what its inventor calls “Any Screen Computing,” the ability to turn any TV, laptop, phone, tablet, or set-top box into a dumb terminal for its Android operating system. The Cotton Candy has a USB 2.0 connector on one end and an HDMI jack on the other. 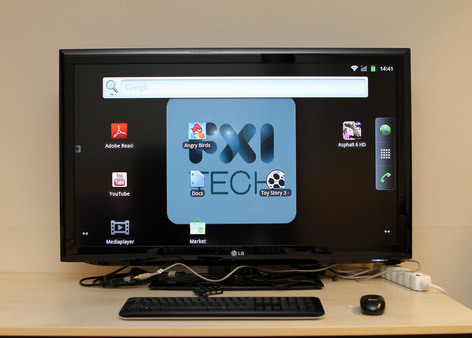 When connected to an HDTV, it uses the HDMI port for video, the USB for power, and Bluetooth to connect to a keyboard, mouse, or tablet for controlling the operating system. The device can output up to 1080p so even a full HD screen can display the Candy’s preloaded Android 2.3 operating system at its native resolution. The dual core CPU can even play local 1080p video or stream HD clips from the internet. From developers to students to mobile workers, there are a number of groups that could find innovative ways to use a computer the size of a USB stick. However, you won’t see a consumer product shipping anytime soon from FXI. The company plans to sell the Cotton Candy to developers and let OEMs license the technology and turn it into something that can appeal to a wide audience.